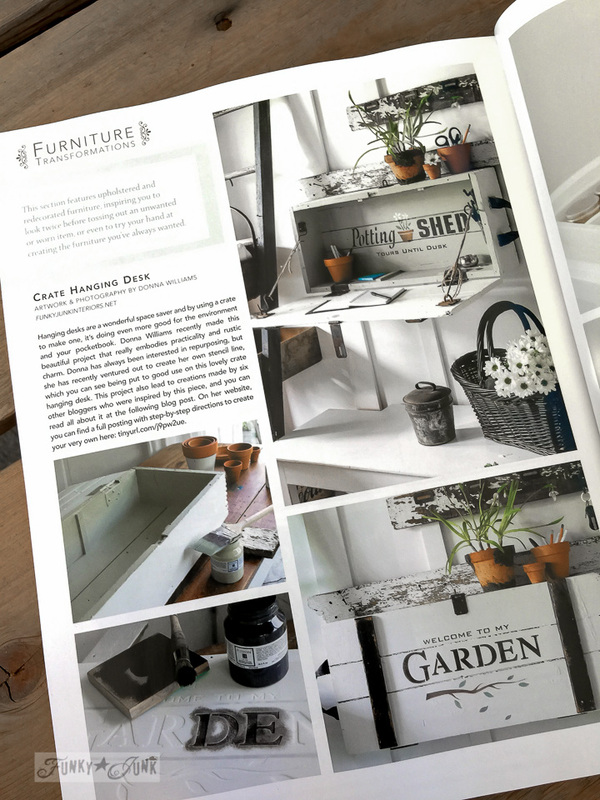 Somerset Home magazine worthy junk… x 3! I’ll never forget the first time I was published in a magazine. And you can bet, when that magazine came out, I scoured every store I frequented, looking for it. I remember this one clear as day. I felt so GIDDY, I actually had a pen in my purse, ready, you know, in case someone was paging through it, then gasped when they came to my (blog name in text with no pretty project feature.) Wow, right? I stood in front of that stand, with magazine wide open to ‘my page’, and in a very obvious manner, made sure anyone walking by could spot what I was looking at. But no one came by. Hmph. What kind of store is this, anyway? So I proceeded to open up as many magazines as I could to ‘my page’, setting them back on the stand. I then left the aisle, then hid while peeking back in, to see if I had ‘captured’ anyone’s interest. No one came down the isle. So I opened a few more for good measure, then left. Giggling at how absurd I was behaving, I was on a high. I mean, my work was printed, and on bookshelves! What’s not to be pumped about? Over the years, I’ve been published a few times now, and I will say this. 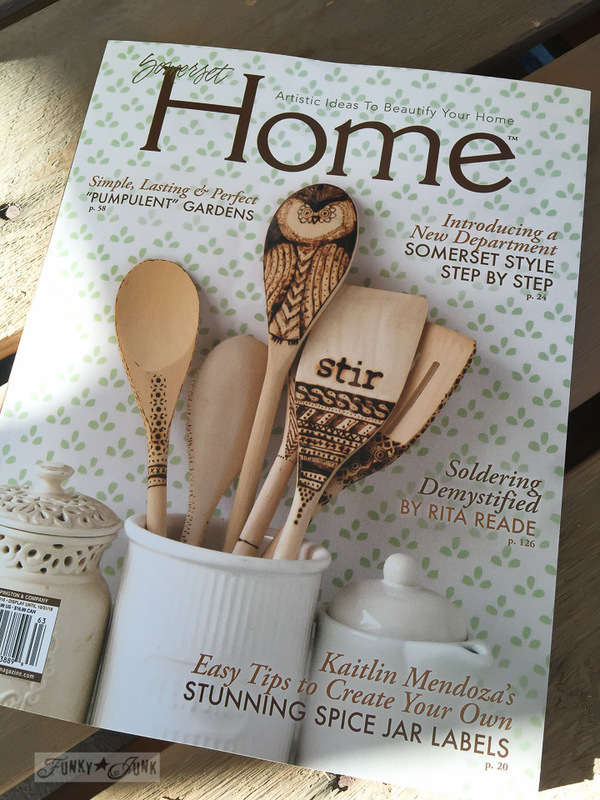 This round, my work is in Somerset Home, Autumn 2016, with 3 projects. 3 3 3 3 THREE!!! I was pretty stunned. The ladder shelf is an older project, but the crate desk with the garden stencils, and Super Market magnetic board are newer. 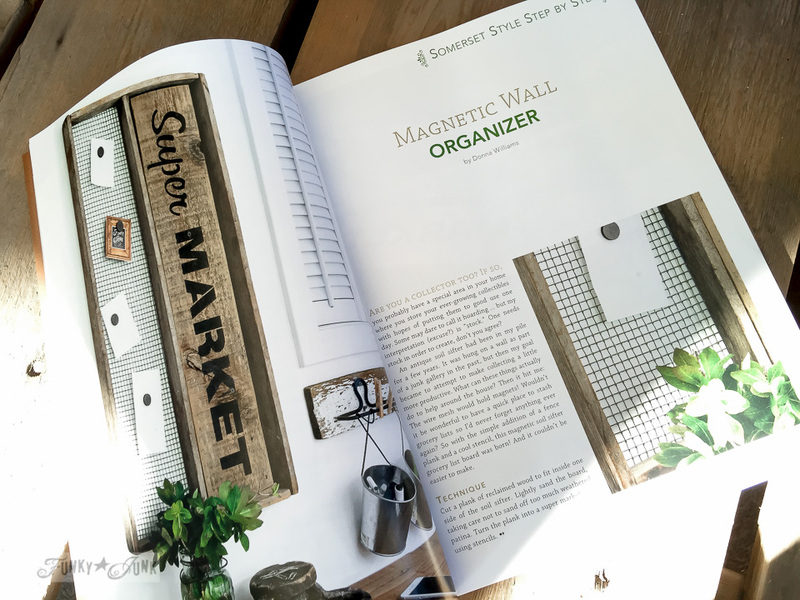 And the magnetic board has a full 4 page tutorial on how to use the stencils! Somerset Home is tricky to find in my region, but I believe book stores carry them. This magazine actually feels more like a published book! The quality and weight really makes a statement. I’d totally open a few up on the stand! What an awesome moment for you! You should feel so proud. I know I am. 🙂 I spotted this at Michael’s Crafts last weekend and wanted to scream to the store, “I KNOW HER! !” And then proceed to show all the shoppers. Beautiful work, D! I can’t wait to see what you do next. Congrats Donna! The feeling of seeing one’s name and work published for all the world to see has got to be AWESOME! So glad for you! I’m not sure if it’s available in my area but I’ll look for it! Congrats Donna…..can’t think of a nicer blogger to get published! If you are ever in Connecticut, I will be happy to have you sign my copy! Way to go Donna, you just have to be very proud of yourself, just look how far you have come. I am going to check out amazon and see if I can buy this magazine. Oh and by the way I am very, very proud of you, you have worked very hard and learned so much you really have earned all the good things happening now. Donna, I received my magazine in the mail last week. What a gorgeous magazine that is and your article is beautiful. Way cool! Congratulations Donna … I’ll either order this online or check it out when we’re “down south”! Congratulations ! 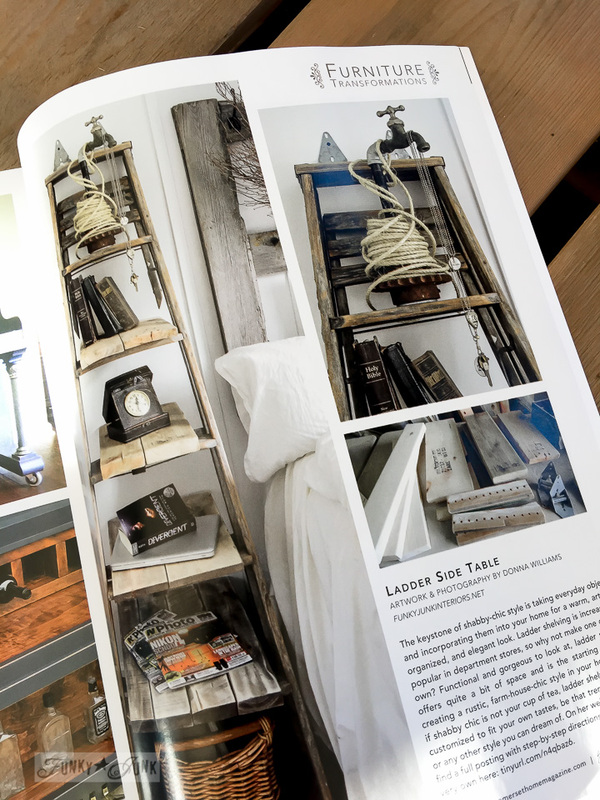 The Somerset house magazines are lovely magazines and your gorgeous photos fit right in ! Yay! Donna! What an honor! You’ve worked so hard for so long. You don’t need a magazine spread to feel accomplished…but it sure must feel good!!! I’m glad I follow you, because you come up with so many do-able projects, along with a few life lessons we can all learn from. You’re thought-provoking articles are something I take to heart. Best wishes in whatever you do! I love the Somerset magazines! They can be found in JoAnnes and Michael’s here in the states! Your projects are wonderful! karen…. There is no one more worthy to have magazine features than you. You have sooo earned it over the years, and your creativity and originality deserve to be recognized. Not to mention your generous Spirit for featuring other creative souls like me. 😉 Congratulations Donna!!! Oh, Maria! I love the work that YOU do, also. How embarrassing that would have been but I hope that they might have understood that you were in a trance and not a thief. Awesome! Congratulations Donna…what a great magazine to have a spread in! Great reason for me to buy another magazine! I’m also happy to hear that it never gets old!! I’d be so stinking’ proud if I got published and WHY shouldn’t you be proud also? Everyone wants to be recognized for their accomplishments. Because of what you do, you are being singled out for your creativity, which is no small feat. I love your confessions but blush to realize I would probably do something similar. Guess what? If I saw you and an article about you, I would absolutely ask for your autograph. Nice work, junking girl. Brilliant – I’ve never heard of Somerset, I’ll watch for it. It sure looks interesting. The first time one of my motorcycle articles was published, a salesman at an area dealership came up and showed me the magazine and said, “Isn’t this you?” I laughed giddily and said YES, and he invited me to autograph it for him – which I did, just in case I became famous. LOL You are right, seeing your stuff published like that never gets old! Congrats, I will look for this one at the bookstore and will leave a copy open for you! Congratulations. If there was a way to publish your work in my magazine, Niagara Escarpment Views, I would! Congrats on the magazine spread! I love the crate wall desk so much, (and the other projects too). Your stencil line adds so much character and fun to just about everything! Congrats!! Great job… Just so exciting. Awesome and well-deserved! Somerset has the most lovely pages and pictures!